We offer wide range of Speciality Lubricants and Industrial Maintenance Products, for use in manufacture and maintenance of Mechanical, Electrical, Food Grade Grease, Corrosion Resistant Grease, Electronic and allied Industries. A huge range of products, in convenient packaging has been developed over years to complement the original products, which is ideal for use in Production, Maintenance and Servicing. Release - On 211 is a heavy duty tacky lubricant with extreme pressure additives for pins and track rollers. It can perform under dusty, dirty and gritty conditions. Reduction of wear and prolonged lubrication protects against corrosion and provides quiet operation of the machine. It forms a thin lubricant film on the metal surface and doesn’t drip down. The lubricant can be easily applied with a brush. 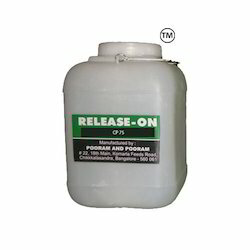 Application: High temperature lubrication specially formulated for continuous sliding components. Clean surface and rub the paste in thinly and evenly with a nonmetallic brush. Frequency of application to be decided on the basis of effective lubrication. Benefits : Core elements which are subject to high friction needs constant replacement for breakage. This can be completely avoided. Special properties Good electrical conductivity resistant to oxidation and corrosion. R 2020 anti-seize paste release on and copper-based anti-seize paste is formulated using micro fine copper flakes in a special oil carrier and thickener. It can be used over the wide temperature range. It acts as a high load carrying thread lubricant while tightening threaded connections and keeps the threads separated even after exposure to high temperature, water/sea water. Advantages: an ideal assembly lubricant for threaded connections exposed to high temperatures and vibratory loads. It avoids seizing and sintering of threaded connections at high temperatures and makes dismantling easy. The lubricating properties provide an optimum balance between the tightening torque and the pretension and protect against corrosion. Field of application: For threaded connections and sliding of all kinds exposed surfaces to high temperatures, such as threaded joints on turbines, gas generators, exhaust pipes, engine heads, team lines etc. As a high-pressure lubricant for rack and pinion arrangements exposed to marine atmosphere submerged in water/sea water. Mode Of Application: Clean the surface thoroughly with a wire brush and a solvent. Old residue and coatings should be removed completely. R-2020 should be applied by a hard brush in sufficient quantity right down to the base of the three. Release on 25 chuck paste is formulated using extreme pressure and solid lubricating additives with a high viscosity base oil. Application : For assembly lubrication of friction and sliding surfaces under heavy, jerky and vibrating stress. Used for lubricating chuck jaw of machine tools. Efficient lubricant with balanced additive combination. Method Of Application : Cleaned the surface thoroughly. Apply using a brush, spatula or grease gun. RELEASE – ON CP 75 is formulated with special EP Additives and solid lubricants to withstand high load carrying capacity at high circumferential speeds, especially in case of open-gear drives of tube-mills and rotary kilns in cement industry. It is a bitumen-free lubricant, to reduce friction and wear on mechanisms subjected to mixed friction. Provides excellent corrosion protection and absorbs vibrations. 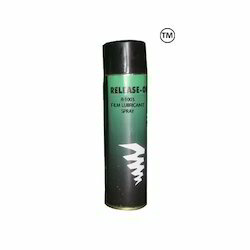 APPLICATION: It is a sprayable type lubricant for large open-gears, plain bearings, guideways, guide tracks, chains, wire ropes etc. Release Of 808 Food Grade Lubricant Paste is a soft buttery texture food grade grease suitable for applications where there is a likelihood of the grease coming in contact with foodstuff. RELEASE – ON 808 conforms to US FDA 21 CFR. APPLICATION: For the lubrication of bearings and sliding parts of processing, filling, packing and sealing machinery in the food and beverage industry. For the lubrication of valve stems, plugs, glands of pipelines carrying chains in the food industry. As a grease for bearings and sliding points operating at moderate temperatures and speed lubrication of rubber or plastic moving parts, lubrication of bearings exposed to hot/cold water, for protection of rubber parts exposed to low temperatures etc. ADVANTAGES: It is tasteless, odor free, non-toxic and white in color. It does not affect foaming properties of. Compatible with rubbers & plastics and does not swell O-rings. It prevents embrittlement of rubbers and plastics at low temperatures. It does not age or disintegrates. R 905 St Paste Release On is a high temperature lubricating, water-repellent paste. A soft consistency that will remain in paste form even at elevated temperature. FIELD OF APPLICATION : Assembly and running equipments, where staining black solid lubricants are undesirable. SPECIFIC APPLICATION : Lubricating pins, rails and guides of moulding machines. R-790 is an organo polymer base product specially designed for rubber to plastic, rubber to metal, rubber to glass, metal to metal sliding surfaces. It can be used effectively as an anti-spatter. r-790 is compatible with rubber, plastic, glass, metal and paints. R 731 Mos2 Special Concentrate Spray (550 Ml) Release On is a colloidal suspension of pure MoS2 powder in high-quality mineral oil. ADVANTAGES: R-731 can be sprayed on evenly on surfaces difficult to reach. It reduces excessive wear and pitting, for high-sliding drives such as worm and hypoid gears. It can reduce heating due to excessive friction and reduces noise level considerably. FIELD OF APPLICATION: Ideally suited for lubrication of sliding surfaces in all machine components, textile machines and other kinds of general as well as special purpose machines. Can be used on all kinds of nuts and bolts as an assembly lubricant. MODE OF APPLICATION: Shake the Can vigorously before use. Spray it from a distance of 6-7 inches. R 840 adhesive chain lubricant spray provides internal and external lubrication of roller chains such as in motor cycles, forklifts etc for lubrication of chains operating in dusty/dirty atmosphere. It has excellent water repellent properties and thus provides efficient lubrication of chains operating under water, sea water or steam. For long-term lubrication of small gear drives, locking mechanisms, hinges, cables, spring assemblies, clutch and brake levers, column guides, wire ropes and machine parts exposed to water. For effective lubrication with r-840, it is necessary that the chain is thoroughly cleaned and old lubricant residues are completely removed. After cleaning spray the product from all accessible sides and wait for few minutes for the foam to subside. In the event of new chains, all anti-corrosion coatings must be removed. 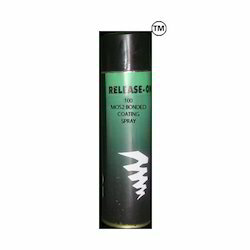 A release of 100 mos2 bonded coating spray (550ml) is formulated with extremely pure molybdenum disulfide powder with a suitable bonding agent in a solvent medium. Fields Of Applications : As a dry lubricant coat for sliding surfaces operating in dirty/dusty atmosphere. For lubrication of coarse chains and guide ways operating under high loads and exposed to high temperatures. Joints and sliding surfaces of earth-moving equipments, etc. Surface Preparation : Clean the surface thoroughly with a solvent. Surface to be treated should be free from oil, grease and other contamination. Roughening of the surface by wire brushing, sand blasting of phosphate improves the adhesion and life of the lubricant film. Mode Of Application : Shake the can vigorously at least for a minute before use. Spray from a distance of 15 – 20 cms to give a thin even coating. R 720 multi-action spray (550 ml) has an extremely high penetration capacity. For easy and quick dismantling of seized or corroded screws, bolts, chain links, joints, levers, springs, valves, locks and hinges in factory, workshops, and motorcars. Points susceptible to corrosion are effectively protected against corrosion, displaces moisture and eliminates squeaking noises. R 750 Heavy Dutycorrosion Protection Spray(550 Ml) Release On is formulated using high flash-point corrosion inhibitors for highly polished surfaces. It leaves a thin, soft, translusant film. It can be used to protect metals like steel, aluminium, cast iron, zinc etc., for both indoor and outdoor, for a minimum period of two years. It is compatible with rubber and plastic. FIELD OF APPLICATION :Protecting metal components, machines, Highly polished surfaces, chains, valves etc., This gives protection in extreme marine atmosphere. 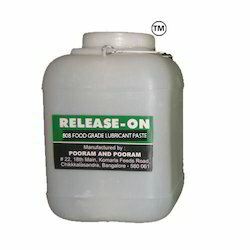 R 1003 Film Lubricant Spray Release On is formulated using polymer-based additives and solid lubricants. 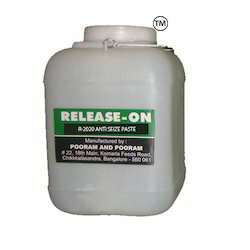 Available in Aerosol Spray of 550 ml. APPLICATION : It can be used on hinges, threaded joints, conveyor wheels, sliding surfaces, gears, crank shafts. BENEFITS : Good adhesion properties, resistant to cold and hot water, long-term corrosion protection. Reduces wear considerably. Effective lubricant under dusty atmosphere.